…………………………………………………………………………………………………………………………….. The video is somehow remnant of an era of which we may start being nostalgic, as it speaks of the access of the previously excluded to cultural production, and the vibrancy and quality that such access brought to society in general. It was made and presented by Johnny, a funktastic DJ from Lisbon. It also said a lot about the many-sided abilities that today artists carry with them besides the main skill people usually recognize in them, which is somewhat close to what I intend to explore in my presentation at the disPlace conference this coming weekend in Porto – while addressing recurrent preoccupations on what the architect’s role vis-à-vis contemporary society may be these days. In a weird chain of thought, however, this accumulation of skills by today’s most successful practitioners also reminded me of what someone was recently saying about the increasing problem of Western democracies regarding the re-distribution of (all types of) wealth within the scope of a crumbling social state. As political oligarchies put down roots, as the richer get richer, and the poorer get poorer, the day seems to not so far in which the economically wealthy are defined as the only ones that have the means to produce anything – from new products to new ideas, from more money to more culture. As the middle class slowly asphyxiates, similarly to what happened in pre-modern societies the new unemployed proletariat will be enslaved to consume only the most basic products in a state of dormant obedience – these products now ranging from basic junk food to basic junk TV, if not the straightforward means to maintain a slightly schizophrenic level of quiescent euphoria. ……..Image from Zombie Apocalypse videogame. And as apparently peaceful revolutions take on the streets to express their confused uneasiness about the situation – just before London, in Lisbon there were two hundred thousand people in the streets, a fact not necessarily connected by local media to the demise of the government – such uneasiness also clarifies why, as Lars Bang Larsen brilliantly put it, zombie stories are again replacing vampiresque tales in the wider collective unconscious. Fiction is always trying to tell you some uneasy truth. It’s funny how a quick holiday trip can turn into an unexpected architectural expedition. When I first booked a flight to Lanzarote I wasn’t expecting much more than volcano sightseeing. 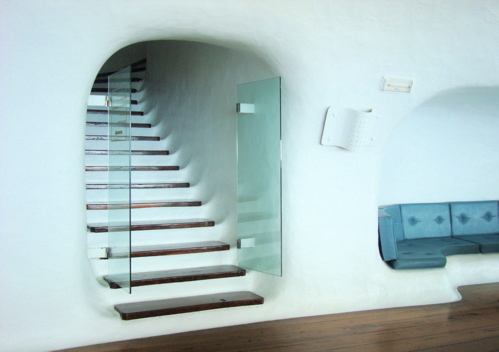 However, it turned out that the Spanish island featured its own local architect hero. César Manrique sure had the monopoly to all the hot spots of the lava island long before wifi came in and the jet set junta turned into the easyjet set. A moonlike crater? A breathtaking view? A lavishin’ grotto? Manrique had a voluptuous bubbly lounge for each and every one of them. I always loved slightly decrepit beach destinations during winter. It must be a Fellini thing. The interesting places in Lanzarote, however, got an extraseason patina whenever Cesar had his golden finger on them. No wonder Rita Hayworth thought Los Jameos de Agua to be the world’s eight wonder. 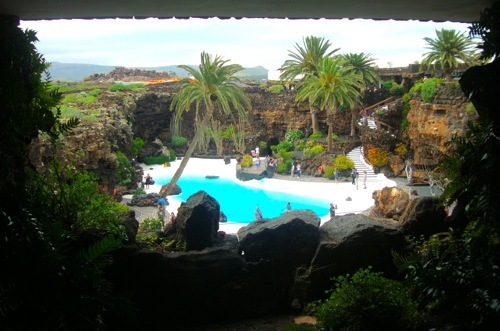 The great thing about Cesar Manrique’s hedonist architecture is that it emanates this definitive kitschy Hollywood aura – while at the same time it reveals an amazing scenic sense of the organic melting into the rough geological strata. This is sensuous, alternative modernism filling in the gaps. The cherry on top the cake, however, is definitely the Omar Shariff bachelor pad, climbing high into a hillside paleolithic landslide. The house itself is drag queen vernacular. The swimming pool ensemble, however, is just dashing. You cannot but start imagining hideously gorgeous parties to the sound of Lalo Schifrin. Meanwhile, it is somewhat bizarre that these Seventies de luxe locations have already become instant fodder for jetloads of low-budget tourists. After all, it took Egypt 4000 thousand years to acquire such suspicious status. However, mass tourism is always there for some good reason. Coming back to his homeland after a brief artistic career in New York in the early Seventies, César Manrique just happened to show up in the islands at the right moment. And he had a sharp intuition on how some enhancements were needed on that extraordinary geography so as to properly welcome the masses. Utopie, subtitled Sociologie de l’urbain, is probably most referential nowadays because in its editorial board was a bright sociological mind – one who became a reference for architects and other cultural producers: Jean Baudrillard. As today one flips through this little French revue’s número un – brought out in May 1967 – one again realizes how some important architecture futures first crystallize in settings that are distant from architecture’s specialized media. Indeed, it is sometimes in other media that the first attempts to synthesize a particular moment in architecture comes about. As such, along the “critical thinking” on urbanism, or timely notes on “marxisme et esthétique” and the consumption of objects, it is also in this outsider’s publication that one suddenly discovers early discussions on the ephemeral in architecture – with topics ranging from the boutiques and the emergency habitats to Cedric Price or Archigram. How more up-to-date can you be? And while Utopies dwelled on the imagination of the villes de papier – with unexpectedly early insights of the role of graphic novels in the visualization of urban futures – on the other side of the channel or the ocean, architects themselves were still clipping photocopies in the fashion of Corbusier, or desperately clinging to classicize modernism in the fashion of Mies. About the same time as Utopie was coming out in revolutionary Paris, in swinging London the conceptual grandfather of Clip, Stamp, Fold and other contemporary adventures, a small black-and-white assemblage of photocopies by the name of clip-kit again got together Cedric Price, Mike Webb, and Reyner Banham, with all of them trying to pin down their references outside architecture – from cars and industrial caravans to gas tanks and the machine logic. While trying to legitimize new languages in the realm of popular production, and even if self-proclaiming their own revolutionary promise or the concern “with progressive architectural ideas,” architects somehow seemed unaware of the true impact of their images and concepts in other cultural realms of their time. On the other hand, half a dozen years later in New York, such “progressive” images were being subsumed to the archive by an enduring intellectual attempt to institutionalize modernism as the true and only rule of the architectural field. Oppositions 1, brought out in September 1973 as a “Journal for Ideas and Criticism in Architecture” by the guiding hands of Peter Eisenman, Keneth Frampton and Mario Gandelsonas, was to dictate where the tectonic avant-garde really lied – from Colin Rowe’s reading of neoclassicism in Modern Architecture, down to Anthony Vidler’s analysis of utopia or Diana Agrest and Mario Gandelsonas’ “Semiotics and Architecture: Ideological Consumption or Theoretical Work”. From then on, one could succinctly and polemically say that it took three decades for architectural media to again try and go “beyond architecture” – and its self-referential academic theories –as it happened with my last pick from the CCA’s collection: Volume #01, out in 2005 as a radical transformation of previous Archis magazine lead by Ole Bouman. In this instance, blending AMO, the C-Lab and mysterious graphic insertions such as the Rive Gauche’s “Total Intellectual Freedom”, Volume was again to reset the coordinates of where the post-critical avant-garde should be – by fiercely committing to strong statements, visual liveliness and the notion of architecture as an expanded cultural field. As architecture was strongly mediatized through other cultural media – from Time magazine to Wallpaper, you name it – so its theory and its specialized media had to move into the realm of communication, to again ground architecture’s relationship to a fast-moving society.